Card Text Play: Archive a card. Discard a card. Flavor text Don’t fret the details. Progress happens when you least expect it. Can I use Sloppy Labwork to archive a card from play? No. Unless it is otherwise stated, you archive cards from your hand. Can I use Sloppy Labwork to discard a card that is not from the active house? Yes. When resolving Sloppy Labwork, you can choose to discard any card from hand, regardless of the active house. What if after archiving a card I have no cards left in my hand to discard? You always resolve as much of an ability as possible. If there are no cards left in your hand, it’s not possible discard. Therefore, the “discard a card” portion of the ability does not resolve. Likewise, if after playing Sloppy Labwork, you have no cards left in your hand, you would be unable to resolve either the “archive a card” or “discard a card” portions of the ability. Even if some – or all – of Sloppy Labwork is unable to resolve, the first step in playing any card is to receive the Æmber bonus – if any – regardless of how much of the card is resolvable. This Æmber bonus is kept, even if the card is unable to resolve. It’s the first turn of the game and I am going first. If I play Sloppy Labwork can I discard a card even though the First Turn Rule is in effect? Yes, Sloppy Labwork will resolve fully. 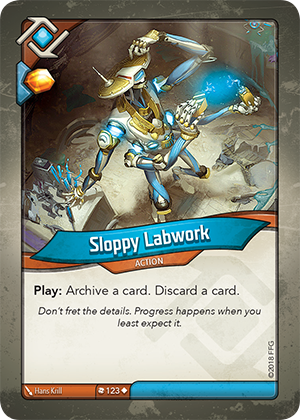 The Golden Rule states “if the text of a card directly contradicts the text of the rules, the text of the card takes precedence.” Therefore, playing Sloppy Labwork will allow you to discard a card from your hand this turn, since the First Turn Rule can be modified by card effects.